wardrobe_remix is one year old today. this was the first ever W_R photograph, of yours truly.it started with one person, myself, and it has grown to over 1300 members today. wardrobe_remix is a DO-IT-YOURSELF street fashion community. sometimes the group gets unruly, and sometimes i wonder if it was a good idea or not! mostly it's really great and fun to watch all the photos and read all the descriptions that everyone has added to the pool. i had no idea it would grow. but something about it resonated, and it caught on. i wonder where it will go, if anywhere. i'm still amazed that people participate, are interested, and like it. it makes me feel like i've accomplished something, though it's a very small thing, in the scheme of things. i guess you could say i'm proud, mostly of all of you! thank you. the photo above was taken during the first couple weeks of class, when i was starting my second semester (of three) at parsons. i took it with my camera's self-timer, balanced on my staircase (that led up to our "bedroom"), as my husband pete was out of town at the time (he takes almost all of my W_R photos). 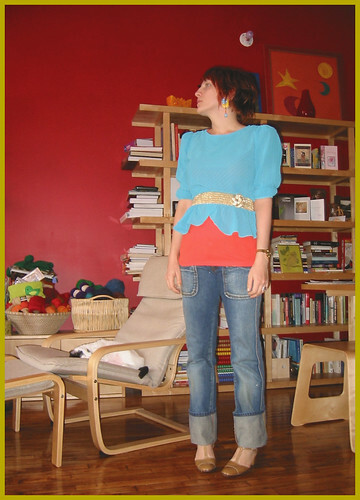 this photo is typical me: some kind of denim, bright colors, vintage clothing/accessories (mostly), even a little handmade-ness (the earrings, made by me for me). this is who i am, good or bad. i started taking pictures of myself because i wanted to show the world how i put it together. i'm a legend in my own mind sometimes! really, i'm just having fun. i've said it before: i think of dressing as an art, and consider clothes and accessories to be akin to the paints a painter uses to make his or her art. it's a way to express oneself creatively, to make a personal statement. above, i'm standing in the middle of my beloved bushwick apartment, back in brooklyn. i miss living in NYC so much my heart is about to break. SF and life here is simply not the same. it's pretty lonely right now and i don't know where my life is going. times were different then, when this photo was taken. learning so much, working hard. there were so many opportunities and potentialities there! i wonder what life would have brought had i been able to stay. i really wanted to stay. perhaps i would have been able to find a job there! frankly, it's not so easy here for fashion-y types, in this land of hills and microchips. *** but...anyhow. here's to another year gone by!! cheers.